The second set of performances hit the stage in downtown Basseterre in the “In the spirit of Christmas” concert series continued on Tuesday. 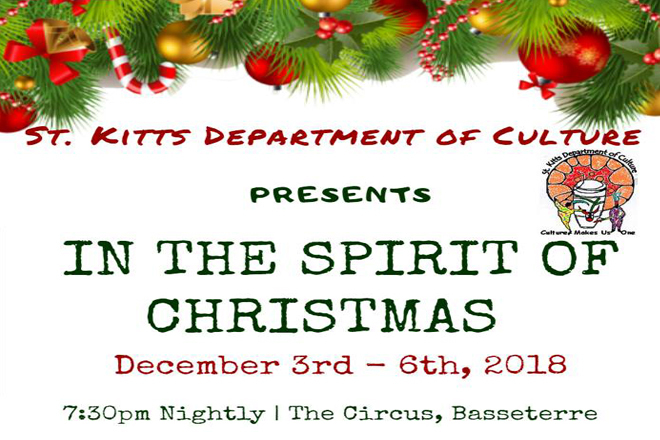 The popular “In the spirit of Christmas” programme continued on Tuesday night at the Circus. The concert was held under the distinguished patronage of the Governor General, His Excellency Sir S. W. Tapley Seaton. A highlight for the evening was the selection given by the National Drum Corp who invited his excellency to participate in the performance. The audience cheered on as the Governor General humorously tapped the drums. Tuesday night’s staging also featured performances by radical praise, a steel pan selection by Ricky, Laurencia Knight, Vakiel, Faith Tabernacle’s Acapella Group, Ebuka, the Africana Grace Choir, Nigenda Walters, Oceans, the Anjolique Dance Company and Chioma Henry. The traditional Christmas concert was hosted by Pastor Keith Warner.